events – Horace Orr Post 29, Inc.
Members of the Georgia National Guard will be out in force, running our Veterans Memorial 5k Race. Many will be in Marietta. But the Guard is currently deployed in many places, including Iraq and Afghanistan. Those deployed Guardsmen will be running simultaneously with us, and we’ll have a live video feed on the Square. If you cannot run, but would like to sponsor a Guard member, you can do so for $20. Our registration page has an Entry Type for this. We will enjoy wine and light refreshments at Marietta Wine Market on Saturday May 11th, from 2-4PM. Public is welcome. All proceeds go to support the charities of our Veterans Memorial 5k Race. Tickets are now on sale for our Concert to honor Veterans and support our Memorial 5k Race. Members may purchase tickets from Legion Race Committee members, or from any Social Quarters staff. Friends may purchase tickets online. WE WANT TO SAY THANK YOU! This event is for Wounded Veterans, Veterans with War/Combat Related Injuries, Paralyzed Veterans and Gold Star Families. Fishing tackle, bait, lunch and drinks provided. Boats and guides will be available. Limited rooms will be provided on a first call basis, NLT 15 Apr, if you live more than 150 miles away. There is plenty of fish in the lake waiting for you! Bring your chairs! Bring a cooler! The Consulate General of the Republic of Korea in Atlanta and the Georgia Department of Veterans Service are partnering to say “Thank You” to Korean War Veterans for their honorable military service and personal sacrifice by hosting a special medal and certificate ceremony. This event will involve the presentation of the Republic of Korea’s Ambassador for Peace Medal and Georgia’s Korean War Veteran Certificate of Honor. The ceremony will be Friday April 12th at 10:00AM. Deadline to submit your request for a Certificate of Honor is April 2nd. Download the flyer. Every Georgia veteran with honorable service during the Korean War (June 25, 1950 to July 27, 1953) is eligible to receive this certificate and peace medal lapel pin (This includes veterans with service in-country and those who were stationed elsewhere in other capacities). It is also available for veterans who participated in the United Nations Peacekeeping Operations through the end of 1955. The Ambassador for Peace Medal began to be presented to veterans as a special memento for those American veterans who returned to Republic of Korea through the “Revisit Program.” The honor was expanded to veterans who have been unable to participate. The State’s Certificate of Honor is personalized with the Korean War veteran’s name, rank, branch of service, and dates of service printed over the Seal of the State of Georgia and includes the official Korean War logo. These certificates are signed by Governor Brian Kemp and GDVS Commissioner Mike Roby. The Social Quarters Staff organized a small Pool for the Men’s NCAA Basketball Tournament Sweet 16. Thanks to Milton for the big assist! We received over 29 entries. Unofficially, through the first two rounds games, Tbell is in the lead with 54 points, Lyle is in second with 43 points, and three people have 38 points. There are two games Saturday, then the Championship game is Monday night. We will pick the winner by total points. 5 points for each correct first round game (Thursday and Friday). 8 points for each correct second round game (Saturday and Sunday). 12 points for each Final Four game (next Saturday). 18 points for the Championship game (April 8th). Be sure to enter your guess at the Total Number of Points in the Championship Game, as our tie-breaker. USAF Captain John Jackie Smallwood of Marietta was declared missing on June 16, 1973 after his plane was hit with hostile fire over Cambodia. 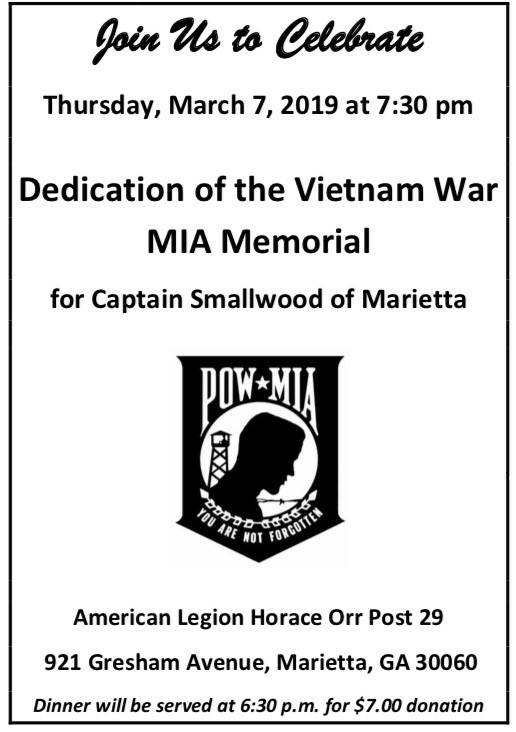 The Georgia POW/MIA Honor Guard will be conducting the Dedication Ceremony during the Monthly Membership Meeting of the Legion on March 7, 2019 at 7:30 pm at Post 29. Everyone is invited to pay tribute to this missing US serviceman and city son. 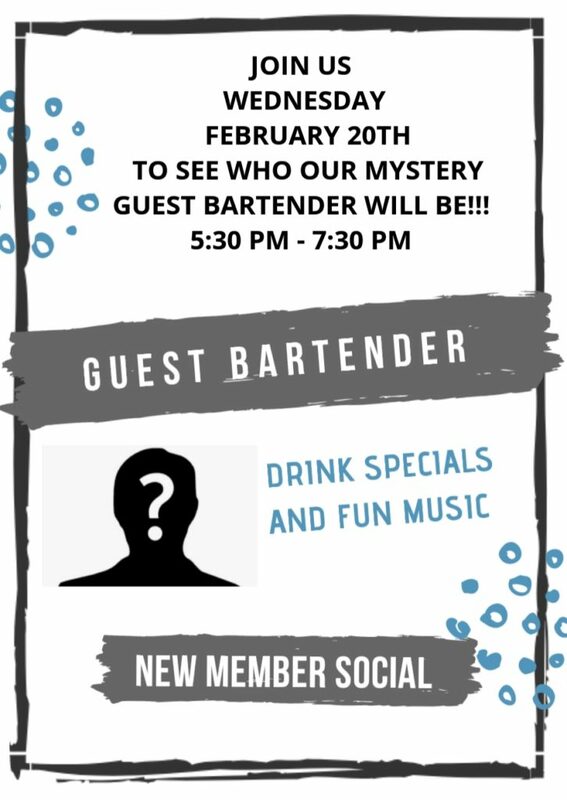 Come meet your new family, and enjoy our mystery bartender. Wednesday February 20th.